Bake potatoes at 400 degrees F for 60-90 minutes or until tender. Remove and allow to cool enough to handle. When cooled, slice off top of each potato and scoop out pulp, leaving thin shell. In a bowl mash potato pulp, mayo, and milk (adding more/less to reach desired consistency). Stir in Velveeta, chicken, and two slices' worth of bacon. Add seasons to taste. Stuff potatoes with this mixture. 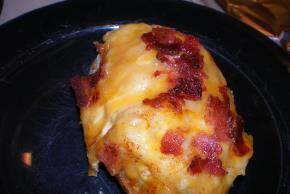 Top with grated cheese, remaining bacon, and a couple dashes paprika. Place uncovered in a small baking dish. Bake 30 minutes or until cheese is melted and potatoes are heated through.